Each user account can send emails from a SMTP server of your choice. Although we recommend the Legalesign email system which is durable and fast. Click 'Admin' > 'Users'. You will see a list of all your users . Click on the email of a user, a pop-up form will appear where you can add your SMTP details. (See image below). Click 'Save' and if the test email is successful you will get a confirmatory message, and a test email in your chosen account. All emails from that account will now pass through that SMTP server. Note that you will no longer receive email bounce notifications directly in Legalesign. If you receive an error message double-check all the details and then contact us if the message persists. Use host 'smtp.office365.com' and port '587'. 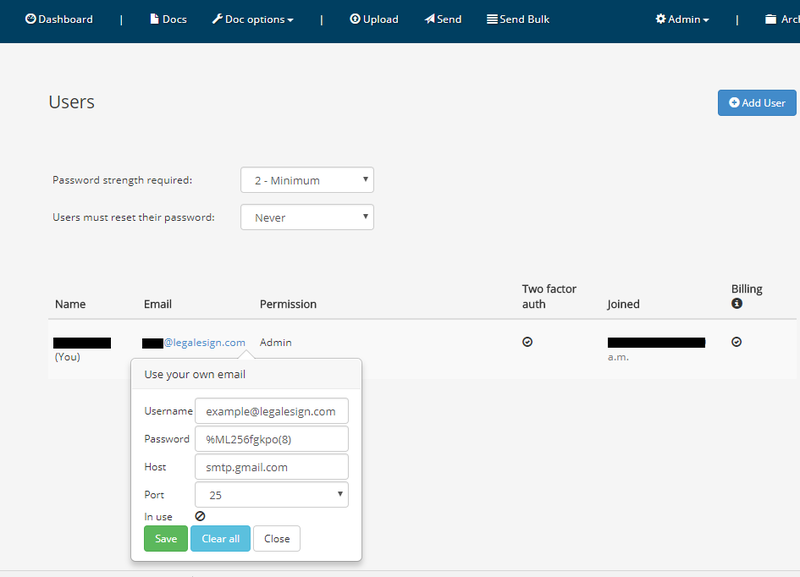 Your Legalesign account login email MUST match your Office 365 email. If you wish to send from Office365 using a different email from your Legalesign registered email, contact support. Gmail is likely to reject your first login. Once you have made one attempt to save your credentials in Legalesign, login to your Google account on your web browser and go to the Security and Devices section. You will see the rejected login, select the option to approve the login and then try again. You should also receive an email from Google alerting you to an unknown login which will give more guidance on how to approve it. If you are having trouble getting through spam filters with Legalesign email (or your own) make sure you add personal messages to your signers.